The return on investment (ROI) for any PLM software project can be quite compelling. In fact, it's often amazing just how good the results can be! With the affordability of PDXpert PLM software, project paybacks are often measured in weeks, not years. Our PDXpert PLM software ROI calculator is simple to use, easy to validate and financially conservative. How does PDXpert PLM software offer great ROI? Is there any better investment you can make? It's simply high-leverage productivity with low project cost. If you've ever scrapped or reworked parts because someone "didn't have time" to look for the latest design revision, you've seen how just a few seconds can cost thousands of dollars. If you've ever recreated a lost document instead of working on a new product, the benefit of secure data management is obvious. And if you dread updating a part across multiple BOM spreadsheets, it's because you know just how time-consuming and error-prone that can be. Product development requires specialized and expensive staff whose minute-by-minute decisions profoundly influence tooling, inventory and assembly labor costs for years or even decades. Engineering change velocity affects initial revenue timing as well as vendor returns, scrap and rework costs. Normal staff turnover can lose previously-developed — and very expensive — documentation as well as knowledge about what changes were approved, when, by whom, and why. While proper data management provides the leverage, PDXpert software's affordable price and flexible licensing translate into low project cost and a quick payback on your initial investment. Through the power of leverage, relatively simple product data management efficiencies can make a big difference to your bottom line. I am convinced that the return on investment from our PDXpert PLM system is far greater than the ROI from our CAD system. Although PDXpert PLM software has many potential benefits, we've focused on 5 areas with simple, easily-estimated inputs that produce clear outcomes. After reviewing a variety of third-party PLM software studies, we've extracted the most commonly-identified benefits that require only minimal data. We've also programmed far more conservative improvement percentages into our PLM software ROI calculator than were observed in actual practice. Although a PLM software purchase is often sponsored by a single department (say, Engineering or Quality), the financial benefits are realized across the entire organization. In fact, some of the most dramatic savings are seen in Purchasing and Production, through more efficient control of materials. 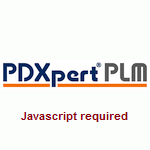 Quickly estimate the financial benefits of PDXpert PLM software. This model applies actual industry experience in employee productivity & change efficiency; design re-use; and reduced rework/scrap. The ROI calculator requires a balanced set of interdependent inputs to forecast the results of implementing a complete system. A realistic ROI requires that you determine what product data you have now, what data you're likely to manage in the future, and who uses that data to add value to your product or process. It's possible to create a theoretical NPV and IRR that's (literally) unbelievable by overstating inventory values, understating burdened labor costs or artificially constraining a large development community to just a few user accounts. Most companies that manage thousands of existing part/document records will have a significant materials budget (whether in-house or outsourced). The calculator looks at the entire system, so if your designs are produced elsewhere, then both inputs and savings are spread across both organizations. (Wage+benefits)/user $20k $30k $40k $50k $60k $70k $80k $90k $100k $120k $140k $160k $180k $200k Labor cost including overhead (burden), per person. Cost of capital 2% 4% 6% 8% 10% 12% 14% 16% 18% 20% Your company's cost of capital over the analysis period is usually somewhat higher, perhaps 2% – 10%, than the forecasted inflation rate. The analysis period should reflect your foreseeable use of PDXpert software — typically 5 to 10 years. It's unusual for PLM software to be acquired, used and retired in less than 3 years. In this case, you should restrict your analysis to a subscription license (below). Import existing parts? Yes No Do you want our professional assistance importing your current active parts from MRP, proprietary database, spreadsheets or other data source? Import existing files? Yes No Do you want our professional assistance importing your current active design/data files (and create the necessary document records) from a file server or other data source? Read-only accounts Assign a Read-Only license to each person who only needs access to data created by others. For example, read-only users are limited to opening existing records, exporting data, running reports or viewing files. Restricting the user group overstates the ROI. The calculator assumes that you'll include everyone who has a role in creating, managing and using your product data. For instance: although it might be possible that a single user can create, release and effectively use hundreds of new documents, parts and changes each year, it's not likely. Your product team obtains the predicted value when all team members work with data in the PLM system. Hourly cost / user Total cost of full-function and read-only licenses, divided by the total quantity of full-function and read-only licenses. Perpetual license MSU is multiplied by the number of analysis years. If this number is notably lower than the average employee's hourly wage, then investment risk is low. Hourly benefit / user Project savings less total project cost (license, MSU, import), divided by the total quantity of user-hours during the analysis period. This represents the additional net benefit that each user contributes during the project period. Net savings / year Project savings for the analysis period, multiplied by the years in the analysis; the result is reduced by the project investment over the same period. Although simpler than NPV, total net savings is useful only for relatively short analysis periods with low-cost capital. Payback period Time required for the accumulated cash flows to offset the initial project investment. Indicates how quickly the project's original investment is recovered, after which the project returns positive cash flow. Internal rate of return The discount rate that makes the project's calculated Net Present Value equal to 0. An investment is warranted when its IRR is greater than the cost of capital. PDXpert benefit The project's net present value is the expected cash benefit reduced by the project investment during the analysis period, taking into account the time value of money (cost of capital). 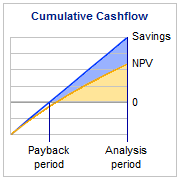 NPV measures the project's impact on company value, and is considered the best financial metric. The ROI model handles typical situations well, but watch for corner cases. Typical product design and manufacturing operations will usually see per-hour savings of up to 50 times the software's cost per hour. A ratio higher than 50 indicates that the planned user accounts may be insufficient for managing the new & existing product data, resulting in an unlikely ROI. This condition is indicated as Users? in the results. As mentioned above, the improvements we apply are significantly more conservative than typical industry experience, while the key costs are all based on your own company's actual experience. Even when used with very rough estimates, the formulas can provide valuable insights into potential savings. Of course, if you already have better-than-average processes and think the model is too optimistic, you can simply cut the calculation results further. Or, consider other companies' documented experiences (below) to create your own model using our 5 simple formulas. Independent studies by Aberdeen, Accenture, AMR, CIMdata, IBM, Oracle and others have consistently shown that PLM software has a profound effect on increasing productivity and reducing costs. The largest corporations often spend millions for their PLM software, and therefore can afford the detailed studies that confirm a compelling ROI. By assessing expected per-employee and percentage-based improvements, you can estimate the advantages of PLM software for your own company regardless of its size. These benefits are achieved using affordable PDXpert PLM software that offers a quick payback	and high net present value under most investment scenarios. A "typical PDXpert system" consists of a perpetual license for 20 full-function users and 30 read-only users with annual MSU, amortized over 5 years. The average financial return is based on a study of ROI calculations over a 12 month period.